3) Almost half of the world’s population lives where? (a) in skyscrapers (b) in Asia (c) near the ocean. If you guessed the “ocean” answer for each question, you are correct! Earth’s oceans support life across the entire planet, but we have only explored about 5 percent of their vastness. While they remain largely a mystery, humans have relied on oceans since our beginnings. Just think about metropolises like Seattle, New York City and Hong Kong: They are built on estuaries, where fresh water meets the ocean. For centuries, these productive mixing zones have allowed humans to feed our bodies, cultures and economies. But unfortunately, humanity’s relationship with the world’s oceans hasn’t been symbiotic. World Oceans Day is this Friday, June 8, and the theme of “preventing plastic pollution and encouraging solutions for a healthy ocean” reflects how we’ve taken our marine ecosystems for granted. Plastic and trash wash ashore the turtle nesting beaches of Sangalaki island in the Derawan island chain off East Kalimantan, Indonesia. Photo by Mark Godfrey. Trash in our oceans is the most recognizable impact: 10 metric tons of plastic fragments make their way into the Pacific Ocean every day. Marine creatures can choke or become tangled in plastic and other trash, and plastic has even been found in some seafood humans eat. Polluted stormwater runoff is a major contributor to the declining health of Puget Sound. When rain lands on roads and other hard surfaces, it flows to drains and carries contaminants (brake dust, oil, fertilizers, etc.) to the ocean. This can impact the health of aquatic species. For example, adult coho salmon exposed to polluted stormwater may die before they are able to spawn. Carbon-dioxide emissions are a major component in climate change, and much of the carbon pollution in our air dissolves into sea water. Did you know that more carbon dioxide is stored in the ocean than in the atmosphere? So, what can we do about all of this? To address ocean pollution from stormwater and carbon dioxide, you can drive less, plant trees and rain gardens or depave your driveway, among other things. To reduce trash in our oceans, avoid single-use plastics, recycle and keep our coasts clean. Here’s the good news: Keeping our coasts clean is a simple and fun way to help out the oceans. Our friends with Coast Savers, Washington’s Marine Resource Committees and Surfrider regularly host beach cleanups to assist local economies, recreation and habitats. Check them out! Other groups work to remove specific trash from the water, such as derelict crab pots that can continue to kill crabs long after they have been forgotten by the pots' owners. 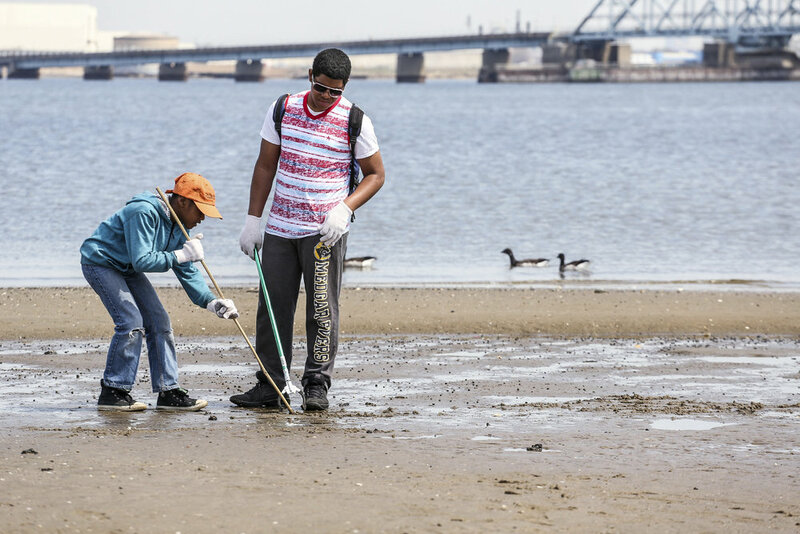 More than 200 volunteers turned out to a "Connect with Nature" beach cleanup at Jamaica Bay Wildlife Refuge in New York City. Give an "Hour for the Ocean" at a beach cleanup near you this Saturday! Photo by Jonathan Grassi. How much plastic (and other trash) can you collect? Get a head start at keeping trash out of our oceans by cleaning up a coast this weekend! Join us at Myrtle Edwards Park on Saturday, June 9, to participate in the Seattle Aquarium’s Hour for the Ocean. Or scout other sites for a beach cleanup closer to home. Whenever you are out frolicking at Alki Point, the Olympic Coast or any one of the many gorgeous shores of Washington’s coastline, make sure to pack out what you pack in. An easy tip: Bring an extra bag and grab trash on a walk. This is a great way to explore what the tide brings in, learn about beach wrack dynamics and wander aimlessly. Who knew collecting trash could also help you relax? Older PostOur Biggest Ever Contingent Goes to Washington, D.C.